This package is available to non-profit groups such as church groups, sports teams and scout troops. Your group will have use of our party room. We can provide pizza at an addtional charge, or you can bring your own food in. Your group will also have use of our game room with use of our Air Hockey Table, Foosball Table, Skee Ball Game, Mad Dash Game and our Video Arcade Game. 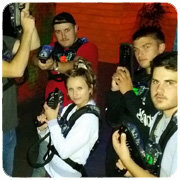 Each person in your group will also play a round of Cannonball Air Blasters and Laser Maze. If these games were purchased seperately, the cost would be $132.00 plus tax. Each person in your group will be able to play two games of laser tag, or one game of laser tag and one game of mini golf. Your package is limited to 22 people. Additional people may be added to the package for $13.00 + tax.